BANFF, ALBERTA, Canada – Looking for exhilarating activities in Banff National Park? 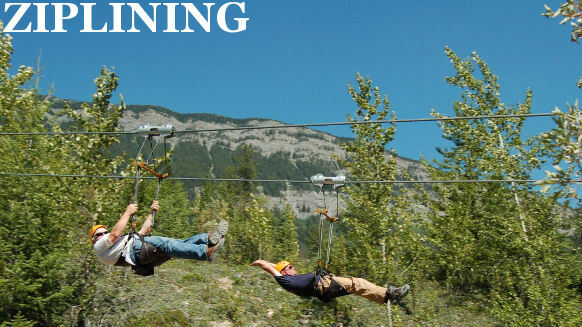 Our awesome Banff Zipline Tour lets you soar over Banff National Park on our fully engineered Zipline system designed specifically for Banff and the Canadian Rockies. Experience the thrill of flight as you zip between rugged cliffs, majestic forests and roaring rivers in Banff. Start with low, short zips and build your way up to longer, higher zips. Our final zipline is 40 meters high and reaches speeds of up to 70 km an hour! After a brief welcome, participants are split off into small groups where they receive individual safety gear and instructions from our certified guides. We then head to the launch platform, where we connect you to our comfortable harnesses. Our system features three dual ziplines at distances of 90 to 500 meters. For those who love hiking in Banff National Park, we lead short educational hikes that explain the ecology and history of Banff, Alberta between each of the ziplines. Your safety is our number one concern, and we go above and beyond to ensure your Banff Zipline Tour is an enjoyable Canadian Rockies experience. All of our Banff zipline equipment meets the safety standards The British Columbia Safety Authority. Our zipline tours are the perfect complement to other activities, such as white water rafting in Banff. Book directly with us to avoid agency surcharges up to $99 per person! Banff ATV Tours through Awesome All Season Adventures bring you to the heart of Banff National Park amidst true Canadian Rockies wilderness. Experience the Rockies like never before! We offer a wide range of Banff ATV tours that take you to some of the coolest and most remote areas of Banff National Park. We’ll show you the remains of an old silver mine dating back to the 1900s, the awe-inspiring Wapta Falls and other spectacular sites in Banff, Alberta. Our fully guided ATV tours in Banff National Park offer a wide variety of trails appropriate for all ages and abilities. Cruise the park on our newer model 4X4 ATVs and experience the rugged beauty of the Canadian Rockies; it’s the perfect way to spend a day in Banff, Alberta! We offer full day or half-day tours from May through October. Watch this Awesome All Season Adventures video and get ready to experience Banff! At Awesome All Season Adventures, we provide you with everything you need to enjoy activities in Banff National Park. That means climbing helmets, karabiners, harnesses, pulleys – you name it – it’s all included in your Banff outdoor sports tour. We recommend wearing the same clothes you’d wear for a regular day of skiing or hiking (depending on the season) to comfort and safety. Remember to have fun, smile and enjoy a unique view of Banff National Park, one of the most spectacular places on earth.